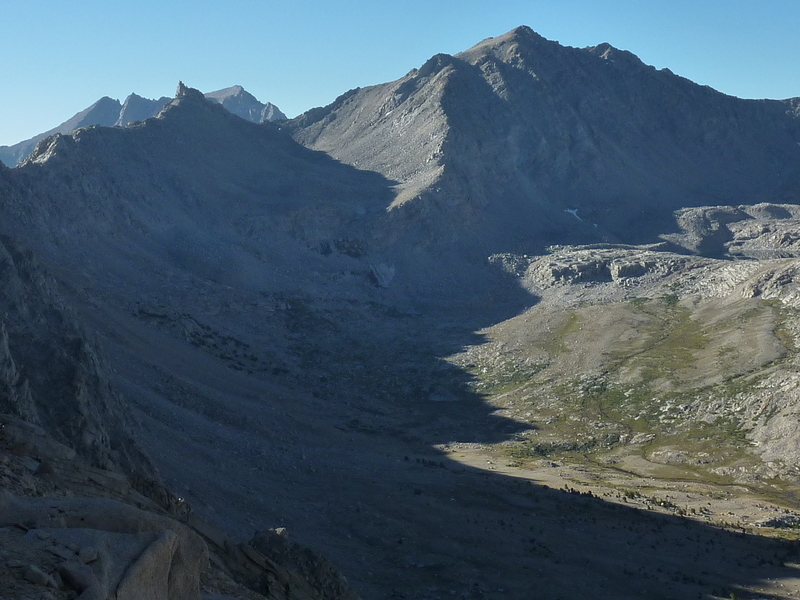 Our goal for the 7th day of this year's Sierra Challenge was officially unnamed Courte-Echelle, a CA 13er located on the Sierra Crest between Mt. Bradley and Mt. Keith. It has also been called Bat Pinnacle according to Secor, a name I came later to learn was bestowed by Andy Smatko and pals. The name derives from their first names: Bill Schuller, Andy Smatko & Tom Ross. Since they have already left their names on other peaks in the Sierra I felt the Courte-Echelle name more appropriate, even if only because it is different. There is some confusion about its exact location in Secor making me think the 13er and Courte-Echelle were two different points, but as we came to find they are indeed one and the same. The summit block is rated as class 5, the first ascent party reported to have used a piton and shoulder stand to reach the highpoint. This was the first class 5 summit in several years for the Challenge and something I was looking forward to. What I and most of the others were not looking forward to was the climb over University Pass which makes for the shortest route to the summit. The Shepherd Pass TH could also be used, but the drive is more difficult and the gain/mileage is more than for the route out of Onion Valley and over University Pass. We had a dozen participants for the 6a start in Onion Valley, cruising through the campground to find the Robinson Lake TH located at the eastern edge - it's not as well signed as the more popular Kearsarge Pass TH and nonobvious to first-time users, but luckily we'd been up this trail more than once in the past and had no trouble locating it. Sunrise on University Peak was a glorious sight as we hiked up the trail in the shadow of Independence Peak. We reached in about 45min where the trail abruptly ends at some campsites on the southeast side of the lake. We made our way around the south side of the lake with fine reflections off the calm lake surface before starting up through the forest on the cross-country portion of the day. There are vestiges of use trail that can be followed to get through the initial forest section leading up the first few hundred feet above the lake, after which it becomes a boulder-hopping exercise for almost a mile. There is a small respite in the middle of the moraine where sand and talus offer some low-angle cruising, but it doesn't last long. Boulders and then steep talus take over as we made our way up to University Pass, no a single patch of snow remaining at this time in a low-snow year. The pass is loose, crappy and tiring. More than one participant made the obvious observation that this would make a better snow climb. It was 8:15a by the time I reached the top of the pass, Eric and Luke already there resting and basking in the sunshine. Really, it's not all that bad as the worst of it took only 20-30min, though I admit it seems much longer. It was at the pass that I first caught sight of Courte-Echelle and observed the pointy pinnacle was also the 13er highpoint. It certainly looked impressive and I wondered why it had never caught my attention on any of a number of previous trips I'd made to the area. Knowing the loosest stuff with greater rockfall potential lay on the west side of the pass, I didn't wait for the group to reassemble before heading down into Center Basin. The class 2 chute on that side is narrow in places and does a better job of funneling rockfall onto the hapless who might be below. I was halfway down before I was aware that anyone else had entered the chute. The others came down singly or in small groups, some of them coalescing again in the boulder fields below the chute or at the bottom of Center Basin. Eric caught up with me and the two of us continued in the lead heading southeast along Center Basin in the direction of our summit. With the summit shielded by a false summit as we approached the base of the mountain, we started our ascent a little too early, partly to avoid a small headwall (that can be climbed directly up a ramp through the middle I found later) and partly because we thought we were headed for the summit. After much tedious scrambling up the boulder/talus slope we reached the crest where large broken slabs of granite made for some interesting class 3-4 climbing most of which we found completely unnecessary once we peered over the false summit to see the highpointl still a good distance to the south. The rest of the group would fare no better in the route-finding, climbing to the same false summits and then having to do some hard class 3 to get around it. A few gave up at this point, deciding the peak was too rich for their liking. Undaunted, Eric and I pressed on after that first false summit, passing a second and reaching the base of the summit pinnacle in another 20min, arriving around 10:45a. After putting our packs down, we explored the summit blocks and our options for reaching the highest one. A long slab, some 20ft by 2ft formed a lower block to the west which took a mantle and some muscle to climb, but offered a good perspective from which to view the summit block. The higher eastern block was no picnic, that was for sure. The easiest way to the top seemed to be the same as the first ascent - a shoulder stand up the vertical west face of the east block. We made a half-hearted attempt at it before the others arrived, but realized that if the lower guy (me) collapsed, we would both tumble into a hole adjacent to the summit block and fall 20ft before shattering all our bones. It seemed wiser to wait for more help, perhaps to have two people support the upper one. We did not have long to wait. Over the course of the next 30min we were joined by Jeff, Michael G, Tom, Nick and Jonathan. While Jonathan poured over the contents of a Smatko register he had discovered buried in the rocks (and Eric and I had somehow missed), others were discussing the possibilities for climbing the summit block. We had brought a rope, a few harnesses and some slings to cover some of our options, but initially we didn't see anything better than the shoulder stand idea. Tom, who has a more extensive rock climbing background than the rest of us combined, quietly mulled over the features of the block before suggesting he thought he could climb it with a belay. His plan was to climb it at its southern end where a move to push off a lower block and onto the edge of the summit block looked dicey. The belay I provided was enough to keep him from dying, but probably not from getting hurt should the initial move fail. He'd probably bounce off a few blocks before the rope stopped him on a fall, but he wouldn't do the 20ft drop Eric and I feared, nor would he plunge the more than 500ft of the East Face immediately on the other side of the block should he push too far. While we waited with baited breath, Tom made it look almost easy. He gingerly pushed off the lower block and swung over onto the narrow edge, maybe a foot wide, before climbing up to the highpoint. Success! Tom used the piton found at the summit to anchor himself and then one by one belayed four others to the summit. I went second and found it a cinch now that there was an upper belay. Though the move was tame, the exposure was enough to make one's head spin slightly. After joining Tom briefly at the highpoint, he lowered me back down the west side to give someone else a chance. Going next, Eric demonstrates the initial start, the push-off, transition to the edge, joining Tom at the summit, and lowering. Jeff and Michael G went up in turn, Jonathan and Nick declining. We generally agreed that it was a 5.6 move with a large exposure factor and one of the finest Sierra summit blocks we'd encountered. Nearly an hour and a half had passed since Eric and I had first reached the base of the block before we had put away the gear and started back down. A few other participants would reach the summit after we'd left, but without a rope, gear and our fearless leader, Tom, they would have to be content with signing the register and leaving the top of the summit block untouched. After coiling the rope I was the last of our group of seven to leave the summit. We went more directly down the west side of the peak, an easier route than the one we had taken up, mostly class 2. I got separated from the others traveling in smaller groups through the boulder field and spent much of the afternoon solo. When I returned to the west side of University Pass I decided to head up a prominent white chute well to the right (south) of the pass. The hope was that the more difficult scrambling would avoid the more tedious aspects of this side of University Pass which can be a tiring grind based on past experiences. My route turned out to be longer, but more enjoyable as hoped. The white rock that is so clearly evident from below in the chute makes up the hardest part of the route, a stiff class 3 slab climb up a dry drainage channel where the chute narrows the most. Below this is a lot of non-plus talus climbing, not unlike the lower part of University Pass. But the scrambling above is on good rock, lots of slabs and fairly clean granite. Rather than traverse far left to University Pass as I was near the top, I continued up to informally called PhD Peak on more of an ascending traverse to the north. I had passed over the modest summit just south of University Pass some years earlier on my way back from Mt. Bradley and had left an aluminum register cylinder to replace the weathered container I had found there. I was curious to see if it was still there. It was. After the short class 3 scramble required at the very top, I found the register at the summit supported by a few rocks to keep it from rolling away. The weathered book dating to 1989 had only 9 pages of entries, of which I recognized most the names - Eric Lee, Brian French, Tom Becht, Brian Kalet and others. I actually had more entries than Bob Rockwell (a first) and it's probably the only register I've signed three times. After putting the register back I headed down to University Pass, an easy descent taking less than ten minutes. Hearing voices, I found Jonathan and Ken Yee (who had turned back from Courte-Echelle at the false summit) resting to one side, engaged in conversation. After joining them for a few minutes, Jonathan and I then headed down the east side, Ken following at a slower pace. I did a poor job of chosing my route on the way down, moving too far north and finding myself descending through some class 3 cliffs found there while Jonathan picked a better route to easily beat me to the bottom. In the mile of boulders above Robinson Lake we came upon Jonathan's brother, Lincoln. He had gone to the summit of University Peak and was taking his time getting back. Jonathan and I had tried to sneak up without him seeing us, but he had been alerted to our presence by Jonathan's all-to-familiar booming voice well before we had first spied him. After a few minutes chitchat during which Lincoln was gathering water from the trickle of stream flowing through the moraine, Jonathan and I continued down together, eventually making it back to Onion Valley by 5p. It had made for a long day, but because of the extra time at the summit we weren't as tired as we might have been after 11hrs on the go. Success at the summit of Courte-Echelle had made it a particularly enjoyable day of the Challenge for me. Eric continued to consolidate his lead in the Yellow Jersey by getting back an hour and half before me - no slowing him down when he doesn't hit up the bonus peaks. He still held a virtually insurmountable lead in the King of Mountain compettion and had no real contenders for the White jersey. In the Green jersey race (the only one for which Eric wasn't eligible) I still held a 45min lead over Jonathan since we returned together today.